Get 20% off your advance order of copper range hoods or other metal range hoods! We have a great selection of copper range hoods, and when you order at least 10 weeks in advance, you will get special discount pricing. Our beautiful range hoods are of the highest quality, made with 14 gauge (48oz copper) in Pennsylvania, USA. If you have a particular design in mind, let us know. You can also browse our range hood gallery for ideas, or give us a call. We freight all over the United States and beyond. 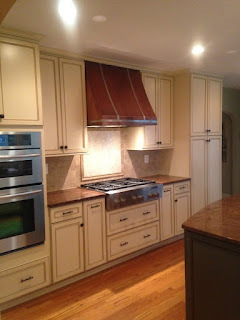 The range hoods above were made by The Metal Peddler, in Western Pennsylvania. Enter to win $100 Voucher from The Metal Peddler! We are giving away $100 coupon code for use with any product for sale on our website! Use it to buy a pot rack, house address numbers, a new backsplash or towards a copper top for your bathroom vanity! The only conditions are that you use the code by the end of August 2010. 2. Earn one additional entry by posting your own photos of the product you bought from us! It could be numbers on the side of your house, your copper fence caps in the yard, or your beautiful range hood in the kitchen. At the end of April, one name will be selected at random and will be declared the winner. And be entered into a $100 Gift Coupon draw! This solid copper pot rack is combined with solid brass cross braces to create a combination wall mounted pot rack and bookshelf! This has so many uses - from hanging pots and utensils from the side copper bars or brass base braces, to storing lids, spices & even books! Sizes start at 18" x 10" up to 50" x 10"
A copper backsplash is fast becoming an extremely popular design element in the kitchen! 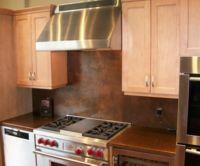 A copper backsplash adds a luxurious look to a kitchen, but is versatile enough that it can fit into a modern, contemporary kitchen or an olde worlde rustic style. The copper backsplash has many options when it comes to finish, color and texture. Hammered, swirled, brushed, shiny or with a patina - there are numerous ways to make your walls stand out! 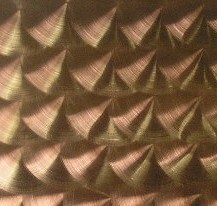 A light colored copper backsplash, hand rubbed & brushed for example, can look great in a contemporary setting. Shown below, a swirl effect gives an almost industrial look without adding yet another element of stainless steel to the kitchen. 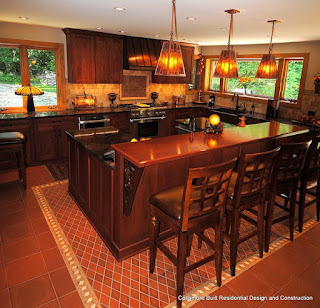 A colored or patinated copper backsplash opens up a variety of colors and patterns. The photo top left shows our signature patina, Pompeii. The color can be also sealed to protect it against stains and discoloration. Perhaps most people are familiar with unsealed copper, which will discolor or tarnish naturally. Depending on the environment, it may turn "Penny Brown" or even have different colors throughout. Many people find that to be a very charming property, but if it's not for you it can be sealed with a lacquer or wax. 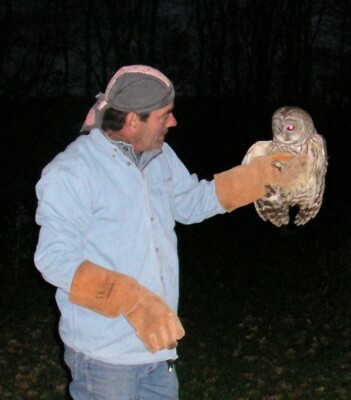 Before the Pennsylvania fall weather turns wintery, two beautiful young Barred Owls were released on the grounds of The Metal Peddler after 4 months rehabilitation at Skye's Spirit Wildlife Rehabilitation Center. After a brief flight over the pond, the owls settled in the woods where we hope they will nest safely. The Metal Peddler supports Skye's Spirit Wildlife Rehabilitation Center, through direct donations & through the sale of our copper barn stars. 10% of every copper star sold is donated to Skye's Spirit. Skye's Spirit Wildlife is dedicated to providing care, rehabilitation & release of injured & orphaned wildlife is Pennsylvania. They always welcome donations so visit their website & see if you can help! Skye's Spirit Wildlife is dedicated to providing care, rehabilitation & release of injured & orphaned wildlife is SW Pennsylvania. They always welcome donations so visit their website & see if you can help! Although most of our products are sold as raw copper some have an applied patina with a high grade polyurethane clear cloat. This clear coat lacquer protects your piece from tarnishing further and from damaging the patina. Care & maintenance is very simple and easy with this finish. Some simple dos and don'ts will protect it for many many years. *Do dust lightly with a soft cloth only. Do not apply furniture polish! *Do use warm soapy water on a soft cloth to remove food splashes and fingerprints. A mild detergent, such as Dawn, will be sufficient. Buff with a clean & dry soft cloth. *Do not use abrasive scourers or sponges. *Do not use kitchen or bathroom cleaning products, such as Mean Green, Mr Muscle etc. These will damage the surface. Avoid acidic or ammonia based cleaners - commercial or home made - that might "eat through" the protection and ruin your beautiful patina. See previous newsletter for tips on cleaning your raw/ non-lacquered copper pieces. The most recent addition to our line of copper pyramid fence post caps is a new size for a full 6x6 fence cap, usually an unfinished cedar post. Measuring 6 1/8" inches square, this new size is a snug fit on 6x6 posts. As with all our fence post caps, this is made of solid copper with a 3/4" lip and pre-drilled mounting holes and is supplied with beautiful solid copper rosehead nails. 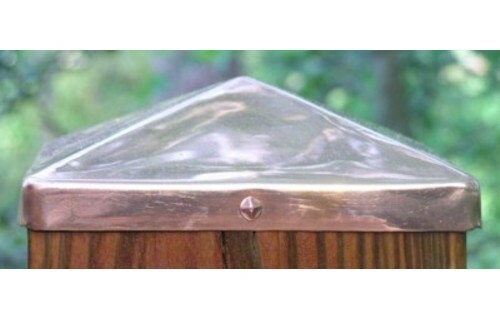 For more information, visit our copper fence post caps page.